I have made this every year since 1982 - always a favorite. Now my children are carrying on the tradition! Not being a fan of raw onions, I favored this recipe because there are no onions! It's sweet and tangy. Remove the pan from the heat, stir in the walnuts (I crush them to make them small bits. You can put them in a bag or towel and use a rolling pin to smash them.) Discard the cheesecloth or the cinnamon stick and cloves in whatever you put them. Transfer to a a ceramic or glass bowl and chill it, covered, overnight to let the flavors blend. I also fish out the lime rinds. This is a photo without the walnuts. 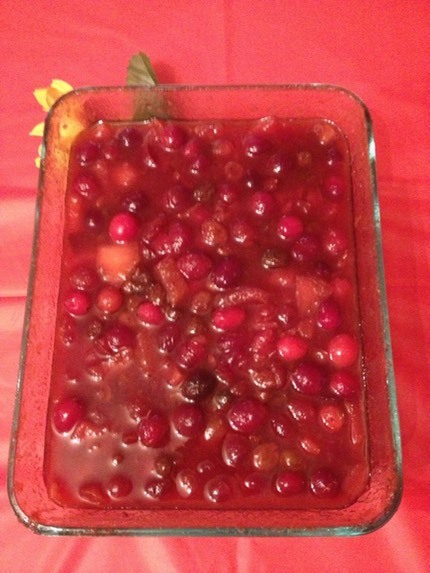 So yummy, I ended up making another batch after Thanksgiving just to have as a nightly desert.